Laem Tong Beach lies at the northern end of Phi Phi Don. By virtue of its remote location this is the quiet end to stay on Phi Phi Island. The 4 resorts starting at the northern tip are Phi Phi Natural Resort, Zeavola Resort, PP Erawan Resort and the Phi Phi Holiday Inn Resort and are all on the beach on the eastern side of the peninsular. This position means that it does well in the hot season and always gets the north easterly breeze to cool you down. It is sheltered from the worst of the westerly winds May to September by a low lying line of hills that protect the main Sea Gypsy Village. This Sea Gypsy Village sounds a lot grander than in reality. A collection of tin roof dwellings closely packed together, sandwiched between the Phi Phi Holiday Resort Restaurant of Chaba Seafood and the PP Erawan Resort Solo Bar and Restaurant of Sawadee, is all that can be seen from the beach. The local boatmen sit out in front of the locals Jasmine Restaurant and watch the day go by offering boat rides to passing tourists but most of the time seem to be content on fishing and talking. The kids go to the mini local School which looks like it has seen better days and is up behind the PP Natural Resort. There are now luxury resort in Laem Tong. 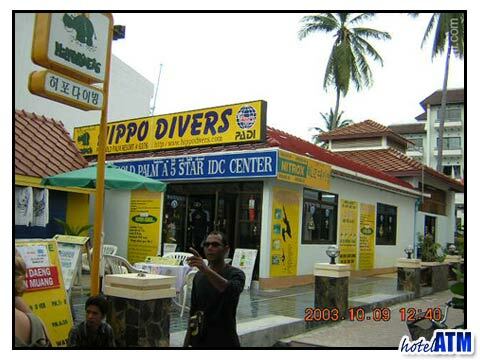 They are the Zeavola Phi Phi Resort and Holiday Inn Phi Phi Island. These resorts justify their position as some of the top getaway accommodation in Thailand. The restaurants are headed by Phi Phi island's best the Zeavola Restaurants of the Baxil and Tocada right on the beach. The Chaba Seafood at the Phi Phi Holiday Resort, Sawadee at the PP Erawan Resort and finally the Jasmine in the Sea Gypsy village. The prices and quality range from the exquisite in the Zeavola to the inexpensive and spicy in the Jasmine. For a traveler or tourist this could easily be a 2 week exploration in culinary experimentation. 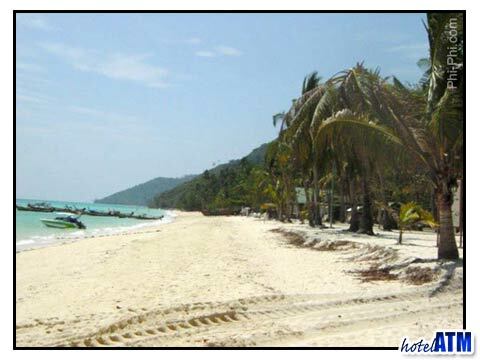 The main walks are along the sandy beach which is about 500m and the jeep track (without jeeps, there are no cars or bikes on Laem Tong) down to Phi Phi Island Village Resort and Spa on Loh Bagao which takes about 25-40 minutes one way depending on your stride. The walk over to Chong Ku which is where the ferries arrive in high season on the west side is only 180 meters from the east coast and this is a perfect place to take in the sunset dropping behind the hills of Phuket Island 45km away. If you are staying in the Phi Phi Holiday Inn Resort they have a view point up behind the tennis courts which is spectacular as it also has breathtaking views of the cliffs at Lanah Bay and Nui bay. The islands closest to Laem Tong are part of the Phi Phi Islands and sit in front of the resorts tantalizingly close and yet they are some 4km away. Mosquito island is dominated by the cliffs and lends it name to the clouds of mosquitoes at sunrise and sunset. The soft coral on the southern shore lines are unique to the Phi Phi reefs and many blue spotted ray can be seen here in season. The Bamboo Island is part of the National Park and is surrounded by an extensive snorkeling reef popular with day trippers. There are simple no fan backpacker type huts there.